In 2018, nearly 2.38 billion people will watch streaming or downloaded digital video content via any device at least once per month. Mobile phones are a key channel for consumption: 78.4% of digital video viewers worldwide will regularly use one to watch. Video viewing is a core digital activity among internet users worldwide, and 65.1% of them will do so regularly this year. Expanding availability of subscription video-on-demand (SVOD) services, including Netflix, HBO Go and Youku Video, will help spur overall viewer growth of 7.2% in 2018. A new breakout for eMarketer’s digital video viewer forecast is mobile phone video viewers. In 2018, 1.87 billion individuals worldwide will use a mobile phone to watch digital video, an 11.9% increase over 2017. Social media is a leading reason for this growth, fueled by Facebook and WeChat’s focus on sharing video content. In addition, uptake of mobile messaging apps Facebook Messenger and WhatsApp has driven use of video chatting. 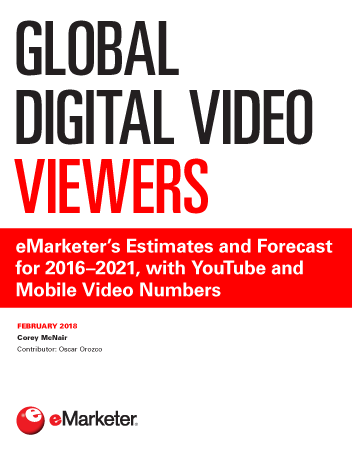 For the first time, eMarketer has estimated YouTube viewership worldwide. Roughly 1.58 billion individuals will watch YouTube at least once a month in 2018, representing two-thirds of digital video viewers. The share of digital video viewers watching the platform reaches nearly 90% if one excludes the population in China, where YouTube is blocked by the government. YouTube viewership is nearing saturation in many markets. This year, the number of YouTube users worldwide will increase 7.5%, just ahead of overall digital video viewer growth (7.2%). This trend will continue throughout the forecast period, with YouTube user growth primarily coming from first-time digital video viewers. "This year, 1.87 billion people worldwide will watch digital video via mobile phone at least once per month, up 11.9% over 2017. These individuals will represent more than three-quarters (78.4%) of all digital video viewers."